BMX Freestyler- Lalo when you arrived at JoMoPro you were plagued with bike issues. 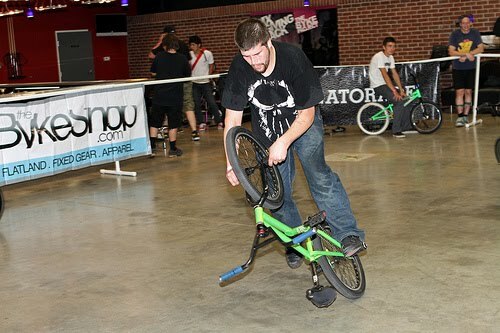 How were you able to keep your bike together during the contest? Lalo Jimenez- Well I should say that before Jomopro I hated doing work on my bike. It frustrated me and I usually just paid to have my bike dialed in. At Jomo I was surrounded by friends and so many people had my back that I learned how to put it together perfectly and now I actually love wrenching on my bike. Mostly I need to give thanks to Joe Miller and Patrick Spence. Joe took time away from his busy schedule and took me into his car looking for bike shops. I have to thank Patrick because when things looked really bad he was the one who took me to Home Depot, found a generic bolt and washer, and helped me Frankenstein my bike. BMX Freestyler- Everyone was looking for you during the awards ceremony. Where did you end up going? Lalo Jimenez- Haha, that’s actually a funny story. I went to Jomopro with no intention of competing. I have only been back in the game a short while and I didn’t consider myself a competition rider. I really just went to hang out and ride with my friends but they’re the ones that convinced me that competition can be fun and offer a new dimension to my riding. I did my run, I felt good about it, and just kind of crossed my fingers hoping I didn’t do too badly. When the award ceremony began I never considered that I’d be asked come up on stage so I was actually out back in the parking lot sharing a few brews with the boys and having a session. I don’t regret it. 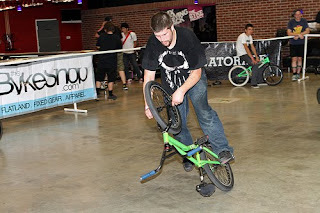 BMX Freestyler - Now that you have a second place under your belt. Which combination of tricks will it take for you to advance to the next level of riding? Lalo Jimenez- Right now I’m just focusing on bike control. I’m trying to clean the rust off some of my old combos and working on overall smoothness. Besides that I want to get turbines down. Having a healthy knowledge of spinning and turbining helps stitch combos together so I’m defiantly spending a majority of my time learning the rhythm and flow. I have a few new links I’m working on too but that’s just going to have to wait until August in Dayton. BMX Freestyler - Is there anyone at JoMoPro you were excited to see? Lalo Jimenez- To be honest I was excited to see everyone. By the end of the second day my voice was horse from cheering. If I had to pick out anyone that I was especially excited to see it would probably be the French cats. I’ve always been a fan of French flatland plus Alex Jumelin was an icon to me growing up. Seeing Mattias really blew me away, especially being in the building during his final run. The electricity was strong in the air and everyone went nuts. Also, its always good to see Effraim too. He’s a cool guy and he’s helped me out a lot along the line. BMX Freestyler- Last words, Shout outs? Lalo Jimenez- I gotta shout out Paul Covey, Bobby Carter, Joe Miller, Pat Schoolen and everyone who gave their time and effort to put on such a world class contest. I want to acknowledge the good people of Joplin especially the gentleman from Home Depot who went out of his way for me sorry I forget your name. Mostly I want to shout out and send some love to my boys, the guys who came with me across state lines and pushed me to progress. Those guys are Ryan Russel, Eric Wright, and Koit; future and current gurus of flat. Peace. LOL "Now that was just nonsense Lalo"